I Just Assembled a $2 Million Mecha. It's Glorious. Earlier this year, Japan's Suidobashi Heavy Industry started making nerd dreams real: it introduced a huge 13-foot mecha it planned to manufacture and sell. 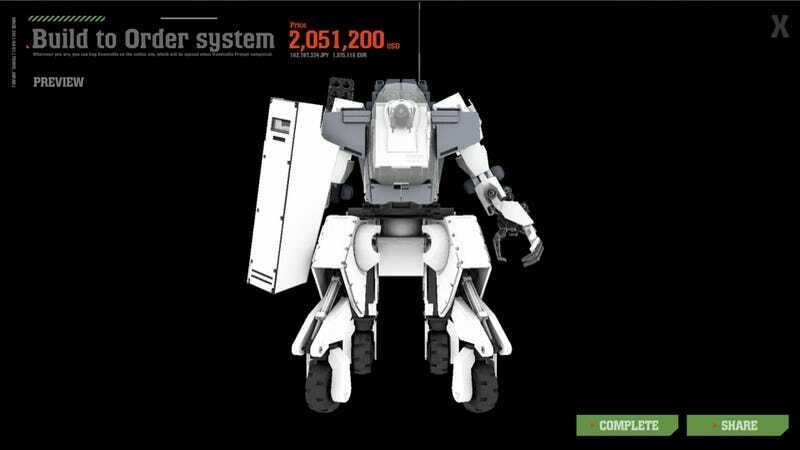 Dubbed Kuratas, people can pilot the mecha, which moves about. There are also options like a water bottle launcher and a gatling gun which fires 6,000 BB pellets a minute. Oh, and you can also control the mecha with your iPhone. Sounds cool, no? You should really try to put together your own. Kuratas starts at US$1.35 million, but if you want things like a drink holder or a genuine leather seat, that's extra. Ditto for the water bottle launcher. In an interview with NicoNico News, Kuratas' creator Kogoro Kurata said, "In the month plus since we've started accepting orders, we've gotten over three thousand." It's not clear if Kurata is talking about actual orders, or doing what I did on the Suidobashi Heavy Industry website: create an awesome, $2 million mecha that I will never buy, press "buy now", and register an email address. Doing so gets an automatic response from Suidobashi Heavy Industry, stating that I will be contacted "within a few days". A few days during which I can bask in the glory of my mecha before being slapped with the reality of its $2 million price tag.